The history of that awful struggle is well known--I have not the intention to record it here, but only to relate some part of what I saw of it; my purpose not instruction, but entertainment. Back along this road raced Crittenden's corps, with those of Thomas and McCook, which had not before traversed it. The whole army was moving by its left. There was sharp fighting all along and all day, for the forest was so dense that the hostile lines came almost into contact before fighting was possible. One instance was particularly horrible. After some hours of close engagement my brigade, with foul pieces and exhausted cartridge boxes, was relieved and withdrawn to the road to protect several batteries of artillery--probably two dozen pieces--which commanded an open field in the rear of our line. Before our weary and virtually disarmed men had actually reached the guns the line in front gave way, fell back behind the guns and went on, the Lord knows whither. A moment later the field was gray with Confederates in pursuit. Then the guns opened fire with grape and canister and for perhaps five minutes--it seemed an hour--nothing could be heard but the infernal din of their discharge and nothing seen through the smoke but a great ascension of dust from the smitten soil. When all was over, and the dust cloud had lifted, the spectacle was too dreadful to describe. The Confederates were still there--all of them, it seemed--some almost under the muzzles of the guns. But not a man of all these brave fellows was on his feet, and so thickly were all covered with dust that they looked as if they had been reclothed in yellow. "We bury our dead," said a gunner, grimly, though doubtless all were afterward dug out, for some were partly alive. To a "day of danger" succeeded a "night of waking." The enemy, everywhere held back from the road, continued to stretch his line northward in the hope to overlap us and put himself between us and Chattanooga. We neither saw nor heard his movement, but any man with half a head would have known that he was making it, and we met by a parallel movement to our left. By morning we had edged along a good way and thrown up rude intrenchments at a little distance from the road, on the threatened side. The day was not very far advanced when we were attacked furiously all along the line, beginning at the left. When repulsed, the enemy came again and again--his persistence was dispiriting. He seemed to be using against us the law of probabilities: for so many efforts one would eventually succeed. One did, and it was my luck to see it win. I had been sent by my chief, General Hazen, to order up some artillery ammunition and rode away to the right and rear in search of it. Finding an ordnance train I obtained from the officer in charge a few wagons loaded with what I wanted, but he seemed in doubt as to our occupancy of the region across which I proposed to guide them. Although assured that I had just traversed it, and that it lay immediately behind Wood's division, he insisted on riding to the top of the ridge behind which his train lay and overlooking the ground. We did so, when to my astonishment I saw the entire country in front swarming with Confederates; the very earth seemed to be moving toward us! They came on in thousands, and so rapidly that we had barely time to turn tail and gallop down the hill and away, leaving them in possession of the train, many of the wagons being upset by frantic efforts to put them about. By what miracle that officer had sensed the situation I did not learn, for we parted company then and there and I never again saw him. By a misunderstanding Wood's division had been withdrawn from our line of battle just as the enemy was making an assault. Through the gap of a half a mile the Confederates charged without opposition, cutting our army clean in two. 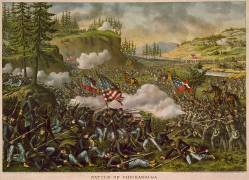 The right divisions were broken up and with General Rosecrans in their midst fled how they could across the country, eventually bringing up in Chattanooga, whence Rosecrans telegraphed to Washington the destruction of the rest of his army. The rest of his army was standing its ground. A good deal of nonsense used to be talked about the heroism of General Garfield, who, caught in the rout of the right, nevertheless went back and joined the undefeated left under General Thomas. There was no great heroism in it; that is what every man should have done, including the commander of the army. We could hear Thomas's guns going--those of us who had ears for them--and all that was needful was to make a sufficiently wide detour and then move toward the sound. I did so myself, and have never felt that it ought to make me President. Moreover, on my way I met General Negley, and my duties as topographical engineer having given me some knowledge of the lay of the land offered to pilot him back to glory. I am sorry to say my good offices were rejected a little uncivilly, which I charitably attributed to the general's obvious absence of mind. His mind, I think, was in Nashville, behind a breastwork. Unable to find my brigade, I reported to General Thomas, who directed me to remain with him. He had assumed command of all the forces still intact and was pretty closely beset. The battle was fierce and continuous, the enemy extending his lines farther and farther around our right, toward our line of retreat. We could not meet the extension otherwise than by "refusing" our right flank and letting him inclose us; which but for gallant Gordon Granger he would inevitably have done. This was the way of it. Looking across the fields in our rear (rather longingly) I had the happy distinction of a discoverer. What I saw was the shimmer of sunlight on metal: lines of troops were coming in behind us! The distance was too great, the atmosphere too hazy to distinguish the color of their uniform, even with a glass. Reporting my momentous "find" I was directed by the general to go and see who they were. Galloping toward them until near enough to see that they were of our kidney I hastened back with the glad tidings and was sent again, to guide them to the general's position. It was General Granger with two strong brigades of the reserve, moving soldier-like toward the sound of heavy firing. Meeting him and his staff I directed him to Thomas, and unable to think of anything better to do decided to go visiting. I knew I had a brother in that gang--an officer of an Ohio battery. I soon found him near the head of a column, and as we moved forward we had a comfortable chat amongst such of the enemy's bullets as had inconsiderately been fired too high. The incident was a trifle marred by one of them unhorsing another officer of the battery, whom we propped against a tree and left. A few moments later Granger's force was put in on the right and the fighting was terrific! By accident I now found Hazen's brigade--or what remained of it--which had made a half-mile march to add itself to the unrouted at the memorable Snodgrass Hill. Hazen's first remark to me was an inquiry about that artillery ammunition that he had sent me for. It was needed badly enough, as were other kinds: for the last hour or two of that interminable day Granger's were the only men that had enough ammunition to make a five minutes' fight. Had the Confederates made one more general attack we should have had to meet them with the bayonet alone. I don't know why they did not; probably they were short of ammunition. I know, though, that while the sun was taking its own time to set we lived through the agony of at least one death each, waiting for them to come on. At last it grew too dark to fight. Then away to our left and rear some of Bragg's people set up "the rebel yell." It was taken up successively and passed round to our front, along our right and in behind us again, until it seemed almost to have got to the point whence it started. It was the ugliest sound that any mortal ever heard--even a mortal exhausted and unnerved by two days of hard fighting, without sleep, without rest, without food and without hope. There was, however, a space somewhere at the back of us across which that horrible yell did not prolong itself; and through that we finally retired in profound silence and dejection, unmolested. To those of us who have survived the attacks of both Bragg and Time, and who keep in memory the dear dead comrades whom we left upon that fateful field, the place means much. May it mean something less to the younger men whose tents are now pitched where, with bended heads and clasped hands, God's great angels stood invisible among the heroes in blue and the heroes in gray, sleeping their last sleep in the woods of Chickamauga. Add A Little of Chickamauga to your own personal library.